Could the Luxembourg team of Schleck brothers be named Leopard True Racing? 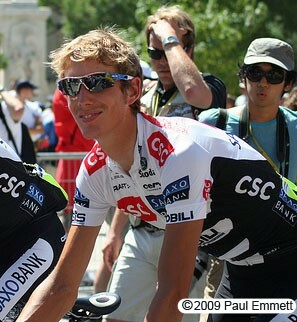 Will the new Luxembourg team headed by Frank and Andy Schleck be named Leopard True Racing? General Manager Brian Nygaard hinted this on a twitter message, linking to the new team's website, which is mostly not functional yet. But Leopard True Racing is printed on the website and some news outlets have speculated that this could be the name of the new team. However, a title sponsor has not yet been announced, so the official name could yet turn out to be something else. Like the planned Australian ProTour team, there has been a long delay in disclosing the name of the main sponsors. What is clear is that Nygaard is confident that the project will be seen as an exciting one. "Watch this space in future for the coolest team in cycling in 2011," he wrote on Twitter. More and more details are emerging. The addition of Jens Voigt was recently announced. Others who have joined include Daniele Bennati, Davide Viganò, Giacomo Nizzolo and Bruno Pires. Linus Gerdemann, Fabian Wegmann, Jakob Fuglsang and Stuart O’Grady are rumoured to be joining the team as well. What is confirmed is that one of the backers of the team will be Mercedes Luxembourg. The firm will providce the team cars and other vehicles, including the team bus. The bikes will be supplied by Trek. Sports directors are Luca Guercilena, Torsten Schmidt and Lars Michaelsen. Kim Andersen is the Team Manager.